IDCON's two-day course teaches a structured approach to problem elimination. Unlike the commonly used Root Cause Analysis, the training focuses on the steps required to eliminate the failure/problem rather than just analyzing it. IDCON analysis shows that 80 to 90 percent of all equipment problems can be eliminated by training and implementing basic problem-solving methods for the front-line. The 10 to 20 percent remaining require more structured problem solving and a larger group. IDCON courses are priced at $989 per student per course. This price includes all materials, lunches and breaks. Review the Course Schedule here. Topics for this course align with the Society for Maintenance and Reliability Professionals' (SMRP) Body of Knowledge - Equipment Reliability Pillar - and offers 12 course hours. 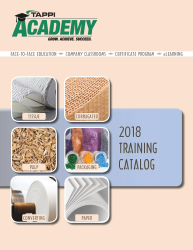 Check out the 2018 TAPPI Training Catalog.